This bedside stand was made as a gift for my mother assuming, of course, that she will accept it. On my last visit I noticed that the stand in the "guest" room was looking a bit shabby so I measured it up and determined that I would make a replacement. Since Mom thinks that I am a "furniture snob" as she puts it I still don't know if she will accept this but I'll drag it along the next time I drive up for a visit. The construction is pretty basic. The sides, back, and drawer dividers are joined by through dovetails as is the base. I got into a bind with the drawer divider joints and was forced to cut them by hand since jig-cut joints would have been difficult there. Surprisingly, I am still able to hand-cut them well although my speed is quite poor. Another glitch came up when I was making the top drawer and that forced me to replace it. This was quite difficult since I had made the dividers and drawer fronts from a single glued-up panel so that there would be a continuous pattern match across the entire front. Luck was with me and I managed to find a decent match in the scrap bin for the butchered drawer front. The drawer bodies are all made of some white secondary wood, including the bottoms. At the bottom edge of each drawer side I have let in a birch wear strip so that the drawers will continue to fit after years of opening and closing. 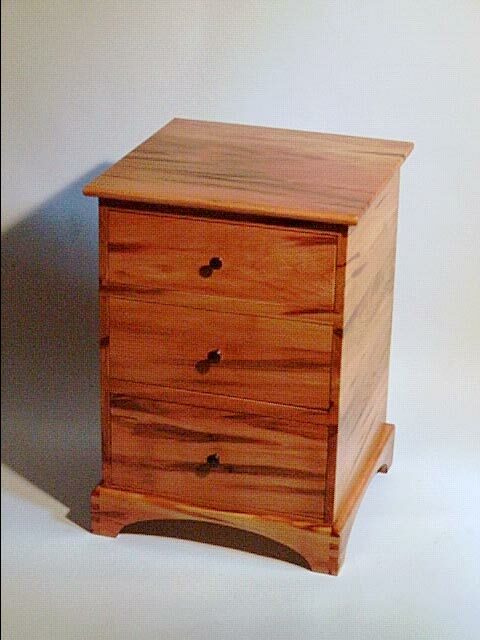 The finish on the piece is boiled linseed oil with garnet shellac padded over. Since it will be leaving my care I applied a bit of wipe-on poly to protect the surfaces before waxing it. The pulls were turned from black walnut. Overall size in inches: 18 X 18 X 25.